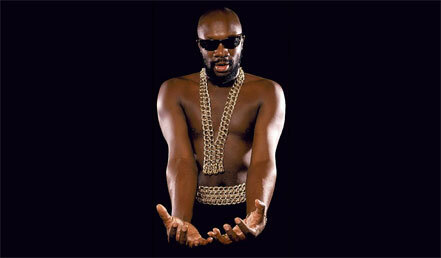 When Isaac Hayes played at the Voodoo Lounge last October, I jumped at the opportunity. Well, that’s not exactly true. My wife, who had been seduced by my Ultimate Isaac Hayes collection, was elated at the prospect and convinced me to buy tickets. I figured this might be our last chance to see him perform in Kansas City, but I didn’t think he’d be dead less than a year later. While the show was solid, Hayes looked shaky. Regardless of his health, or the reason for his frailty, it was still a treat to hear “Walk On By,” “Theme From Shaft” and “I Stand Accused” performed by many of the same men who recorded them over a generation ago. More than even Booker T and MGs, Hayes was the backbone of Stax Records. In the ‘60s, Hayes and David Porter were the label’s go-to songwriter team, turning out hits like “Soul Man,” “Hold On, I’m Comin'” and “B-A-B-Y” for artists like Sam and Dave, Carla Thomas and Johnnie Taylor. After the near-simultaneous loss of Otis Redding in a plane crash and the label’s back catalog in a bad distribution contract with Atlantic Records, Hayes became the label’s biggest star. Stax may have expected more sharp, pop hits when Hayes finally started producing his own albums, but he went the opposite way, transforming unlikely covers into epic slabs of funk and soul. With a deep voice, second only to Barry White as the definitive baby-making crooner, Hayes took left-field selections like Bread’s “Baby I’m-A Want You” to a black audience. The songs may have not been Hayes originals, but the arrangements were. Burt Bacharach’s “Walk on By” ran past 12 minutes with a stirring string arrangement in its first half and stinging guitar and organ interplay in the second half. Running times of more than 10 minutes had become a Hayes trademark. The seminal “Hot Buttered Soul” album had just four tracks and clocked in at 45:05. Even though edited versions were released for radio play, these sweeping performances could not be contained on a 45 and, for the first time, urban audiences started buying albums over singles. And not only were they buying albums, but many of Hayes’ releases were double-LP sets. In the early 1970s, Hayes was the Soul Man. Adorned in gold chains, he was Black Moses. Standing alongside labelmates the Staple Singers, he headlined the 1972 Wattstax Concert, performing in front of a crowd of 100,000 fans. A few months after Wattstax, Hayes received the best song Oscar for “Theme From Shaft.” He was at the pinnacle of his artistry. In 1988 he helped the pre-“In Living Color” Wayans brothers lampoon the blaxploitation genre he helped define, as Hammer in “I’m Gonna Git You Sucka.” Hammer meets an untimely and hilarious demise when, after gearing up with an obscene amount of guns, ammo and grenades, he trips and falls on a stray bullet and is consumed by his own arsenal. Today, Hayes is best known from “Shaft” and his role as Chef on “South Park,” but thanks to sampling, his radio presence hasn’t diminished. Jay-Z’s debut album, “Reasonable Doubt,” could still have been a classic without “Can I Live.” However, it is telling that this song, supported by a sample of Hayes’ arrangement of “The Look of Love,” is the only number from this album that Jay-Z regularly performs. A proud legacy? You’re damn right.